"Chris Kyle Widow Demands Bo French Stop Using Him in Campaign" was first published by The Texas Tribune, a nonprofit, nonpartisan media organization that informs Texans — and engages with them — about public policy, politics, government and statewide issues. Lawyers representing Taya Kyle, the widow of famous Navy SEAL Chris Kyle, sent a cease-and-desist letter Wednesday to Texas House candidate Bo French demanding that he stop using her late husband’s name and likeness in campaign materials. As a political newcomer, French was previously best known for his business partnership with Kyle. The two helped run Craft International, a law enforcement training company. After Kyle died in 2013, his widow sued French and another partner, arguing that they pushed her out of the company. The letter says French is directly violating the agreement, and threatens legal action if he does not confirm in writing that he will stop doing so by Friday. Asked about the letter, French denied that his campaign has been using Chris Kyle in campaign materials. 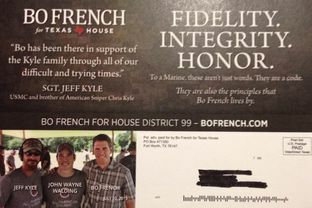 In a mailer that went out recently to voters in the district, Texas House candidate Bo French touted the endorsement of Jeff Kyle, identified as the brother of American Sniper Chris Kyle. French is running in the GOP primary in House District 99 against state Rep. Charlie Geren, R-Fort Worth, who is chairman of the House Administration Committee and a longtime ally of Speaker Joe Straus. In a recent interview on Dallas-Fort Worth’s NBC5, which French posted to his campaign’s Facebook page, he responded to a mailer from Geren highlighting the fraught relationship between French and Taya Kyle. French said he remains close with the Kyle family and has addressed the allegations on his campaign website. Chris Kyle Widow Demands Bo French Stop Using Him in Campaign By Jamie Lovegrove February 24, 2016 Editor's note: This story has been updated. 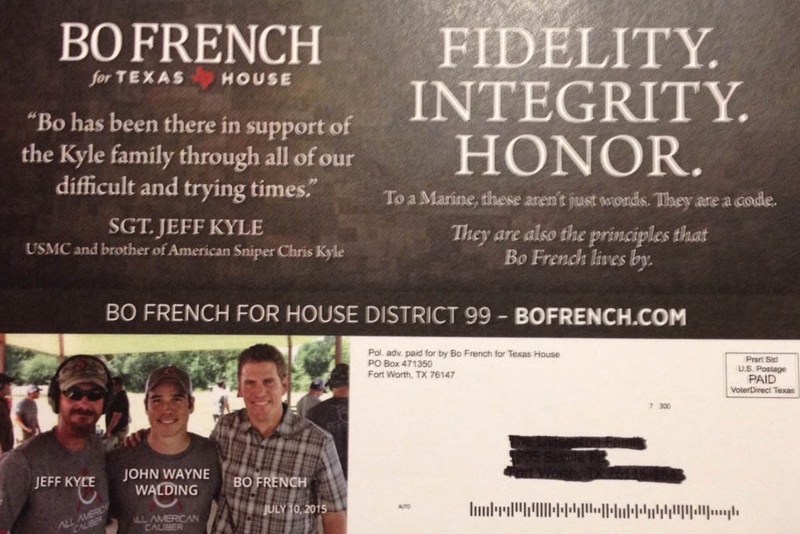 Lawyers representing Taya Kyle, the widow of famous Navy SEAL Chris Kyle, sent a cease-and-desist letter Wednesday to Texas House candidate Bo French demanding that he stop using her late husband’s name and likeness in campaign materials. As a political newcomer, French was previously best known for his business partnership with Kyle. The two helped run Craft International, a law enforcement training company. After Kyle died in 2013, his widow sued French and another partner, arguing that they pushed her out of the company. French and his partner denied the charge and the suit was later dropped, but in November 2014 the parties reached a settlement agreement, according to Kyle’s cease-and-desist letter, that “specifically included a provision that you (and others) not use Chris Kyle’s name, likeness, logo or image.” The letter says French is directly violating the agreement, and threatens legal action if he does not confirm in writing that he will stop doing so by Friday. Asked about the letter, French denied that his campaign has been using Chris Kyle in campaign materials. “I'm very proud to have the endorsement of Chris's brother, Jeff Kyle, and I wish only blessings upon Taya and the Kyle family,” French said in a statement. “I have addressed her concerns by reviewing all the literature which we are currently using and Chris's name is not on any of those materials or mentioned on our campaign website.” But in a campaign mailer sent to district voters and provided to The Texas Tribune, French touts an endorsement by Jeff Kyle. Under his picture in military uniform, he's identified as “Sgt. 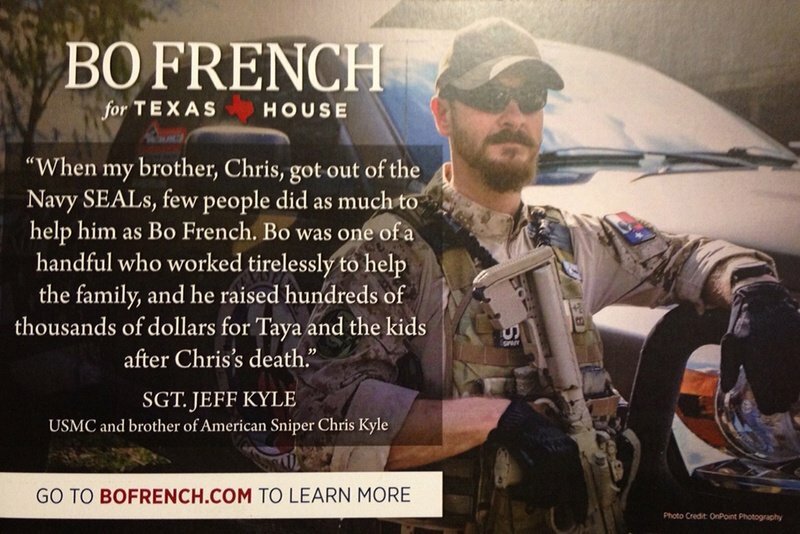 Jeff Kyle, USMC and brother of American Sniper Chris Kyle.” Enlarge In a mailer that went out recently to voters in the district, Texas House candidate Bo French touted the endorsement of Jeff Kyle, identified as the brother of American Sniper Chris Kyle. 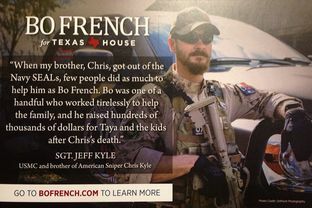 Enlarge “When my brother, Chris, got out of the Navy SEALs, few people did as much to help him as Bo French,” Kyle is quoted as saying in the mailer. “Bo was one of a handful who worked tirelessly to help the family, and he raised hundreds of thousands of dollars for Taya and the kids after Chris’s death.” French is running in the GOP primary in House District 99 against state Rep. Charlie Geren, R-Fort Worth, who is chairman of the House Administration Committee and a longtime ally of Speaker Joe Straus. “It shows desperation,” said Craig Murphy, a spokesman for Geren’s campaign. “It hasn’t even been a year since he told the court he wouldn’t use the name, so it’s odd for him to do that. His campaign has been in a tailspin for weeks and before this I didn’t think it could go any lower, but now he’s taking it down even further.” In a recent interview on Dallas-Fort Worth’s NBC5, which French posted to his campaign’s Facebook page, he responded to a mailer from Geren highlighting the fraught relationship between French and Taya Kyle. “I’m not ashamed of anything I’ve done,” French said. “Chris was a great friend of mine and a business partner, and after his tragic death I worked tirelessly along with some of my coworkers to raise hundreds of thousands of dollars for Taya and the family. Those suits were dropped and a resolution was met, and I’m very pleased with that.” French said he remains close with the Kyle family and has addressed the allegations on his campaign website. “Those allegations are just an attempt by a desperate politician who knows he’s down in the polls,” French added in the NBC interview. “He’s in big trouble in this race. He knows me and knows me well and knows that none of this is true, and it’s really shocking, I think, to most people in the district that he would take this nasty turn.” Reference Taya Kyle Cease-and-Desist Letter to Bo French (149.3 KB) DOWNLOAD "Chris Kyle Widow Demands Bo French Stop Using Him in Campaign" was first published at by The Texas Tribune, a nonprofit, nonpartisan media organization that informs Texans — and engages with them — about public policy, politics, government and statewide issues. Link back to the original article, which is located at https://www.texastribune.org/2016/02/24/chris-kyles-widow-files-cease-and-desist-against-h/.